At the point of purchase, many pork products appear to come from decent, traditional farms - where animals live happy, healthy lives. Sadly, in most cases this is false marketing and the reality is grim. The shocking truth is that the majority of pork produced in the UK comes from intensive operations where the animals live short lives of intense misery. 85% of pig farms in the UK are “Red Tractor Certified”. This is the lowest level of animal welfare with conditions that would appall any civilised human. A Viva investigation uncovered an horrendous pig operation run by JMW farms, which the Daily Mail described as a “hell hole”. Almost unbelievably this torture dungeon for pigs was given the Red Tractor seal of approval. 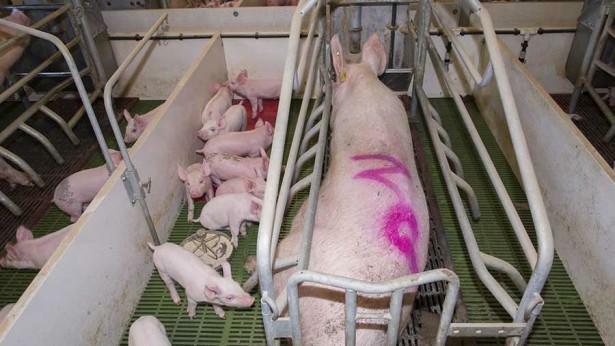 In an intensive unit the breeding sow will birth her first litter when 6-8 months old, she will have 3-5 litters (approx 50-70 piglets) before being slaughtered herself between 1 ½ - 2 years of age, usually for low grade pork products. In the UK 250,000 plus sows currently kept indoors are subject to close confinement in a farrowing crate, typically for up to a week before birthing through until the piglets were weaned. The crate usually has a concrete floor, which may be partially or completely slatted, with metal bars preventing her from turning round, nest building and nurturing her young, which are important behavioural traits. The piglets have a heat lamp as a substitute for the mother’s body heat. A week after weaning the mothers are inseminated again (the majority artificially) whilst still grieving. The process is repeated until death. An intensively kept pig does not get to enjoy their natural rooting behaviour, some don’t even get to enjoy eating solid food. Pig producers are interested in profits, and the cheaper they can feed their pigs without affecting productivity the better. As so many pigs are being kept together in close confinement (a modern single shed can house 8000 pigs), often in poor conditions, and because piglets are weaned so young, disease prevention is high in the stockman’s interests, they don’t want production levels to fall, so they dose their pigs with high levels of antibiotics, just as a preventative measure. Antibiotic use in the UK pig industry (as of 2016) is over five times higher than the government’s target for farm antibiotic use. There is no requirement for any of the animals to be diagnosed as sick before treatment commences. Excessive use of antibiotics in pork is leading to the growth of ‘superbugs’ in humans. Pigs are incredibly intelligent, sociable and playful mammals, who would naturally spend their day frollicking in the forest. Denying natural behaviours causes them immense suffering and distress. EU regulations require that animals are given some material to explore such as soil or straw. Cruel industrial pig “farmers” get around this rule by simply hanging a chain from the ceiling. With nothing to do and no environmental stimulation the pigs go insane with frustration often attacking their friends and family members, chewing and biting ears and tails. To prevent damaging each other, rather than letting the pigs outside so they can play, their tormentors chop off their tails (“tail docking”) and cut off their teeth. These agonising processes are widely performed on UK farms without anaesthetic. When you buy Red Tractor certified meat that has come from an intensive pig farm, you are, in effect, paying a worker to torture an intelligent, sensitive creature in this way. 1. And this little piggy cried “wee wee wee” all the way home. Except he wasn’t going home, he was going to slaughter, like the other 230,000 pigs do each week. The scale of animal agriculture is huge and it is killing the planet. In the UK, up to 12 million pigs are reared for meat each year. The RSPCA's Julia Wrathall said that "a significant number are living out their lives in unacceptable conditions". Humans are systematically abusing our close cousins and it is happening up and down the UK and major players like JMW Farms want to expand their operations. Yuval Noah Harari, the author of global publishing sensations Sapiens and Homo Deus describes industrial farming as one of the worst crimes in history. Altogether, the farmed animals of the world weigh about 700m tonnes, compared with 300m tonnes for humans, and fewer than 100m tonnes for large wild animals. Wild animals are being driven off the planet by farming and it is causing a Six Mass Extinction Event. All of us can have a major positive impact in the world by eating less meat. Increasing the proportion of our diet that is plant-based also has a range of positive health effects. Additionally, if we buy meat we must ensure that it is high welfare. If consumers show the supermarkets and farmers that they demand higher welfare meat products and are prepared to pay slightly more, this will drive the market and demand better production and welfare standards. For pork, you can use the guidelines below. Rule number 1 - always avoid Red Tractor. Generally, the highest level of welfare. Pigs are reared outdoors (but sows and boars may be reared indoors). Soil Association organic bans nose ringing (used to prevent natural rooting behaviour), tail docking, farrowing crates and the use of routine antibiotics. Doesn’t allow the use of farrowing crates and has stricter requirements for tooth clipping and tail-docking. This is not a legal term when it comes to pigs, but should mean pigs are born and reared in outdoor systems. Tooth clipping and tail docking are permitted. Pigs are born and then reared in outdoor systems for around half their lives. The sows remain in the outdoor system throughout their life. Tooth clipping and tail docking are permitted. 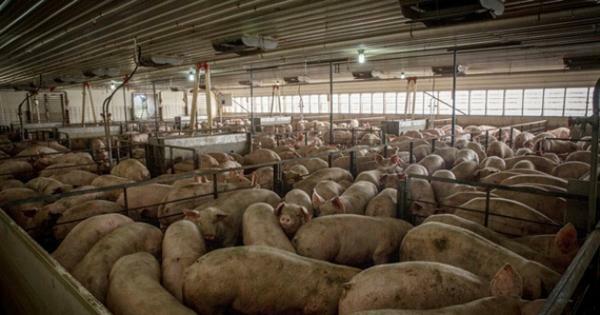 Pigs are born in outdoor systems, but raised in barns after weaning. The sows remain in the outdoor system throughout their life. Tooth clipping and tail docking are permitted. Certifies 85% of pig farms in the UK. Farrowing crates, tooth clipping and tail docking are permitted.